Christopher Nolan's Inception is one glorious head-trip. A film noir-esque exploration of the subconscious, the movie tells the story of Cobb (Leonardo DiCaprio), an "extractor" who invades the dreams of others in order to steal valuable information locked away in their subconscious. What kind of people (apart from psychotherapists) would want to steal your secrets in your dreams, you may ask? Well, corporate espionage is the angle Mr Nolan has hit upon to make his metaphysical film theory palatable to the multiplex viewers of the world. 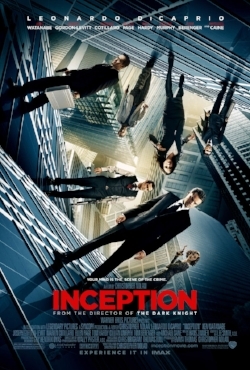 So, Cobb and his right hand man Arthur (the indispensable Joseph Gordon-Levitt) are hired by a shady businessman (Ken Watanabe) to invade his dream as an audition to a more sinister job: to perform 'inception' - the planting of a false memory/idea in the mind of a business rival (Cillian Murphy) for commercial reasons. Cobb enlists the help of Ariadne (Ellen Page) - an architect - and trains her to create a dreamscape within which he and his team can operate (still following?) because Cobb himself can no longer design the environments of a mark's dreams due to the fact that his malevolent wife, Mal (Marion Cotillard), has a nasty habit of popping up at inopportune times and invading the subconscious, in the process leaving the best laid plans asunder. Of course, it all gets very complicated, with dreams within dreams, and a cast of characters that reads like a casting director's dream come true: Tom Hardy, Michael Caine, Pete Postlethwaite, Lukas Haas, Tom Berenger, and even Tallulah Riley in a 2 minute cameo. And it's all wrapped up in some nifty special effects (Paris folds into itself) and one giddy action sequence simulating zero gravity that you have to see to appreciate. As he has done in the past, Mr Nolan has sneakily hidden an enthralling emotional story within the guise of a genre piece; it doesn't matter if you can't follow the what, why and who of the plot - what matters is the emotional trajectory the characters go through, and what the filmmaker is trying to say about (in this case) the persistence of memory and loss. It is no accident that Ms Page's character - the viewer's guide into the maze-like world of the film - is named after the Greek mythological figure who leads Perseus out of the Minotaur's lair, and in many ways, the film can be seen as an unpacking of the labyrinth of the human mind: what layers and secrets are hidden within our subconscious, and how much are they truly worth to anyone other than us? Mr Nolan's deft direction and clever script keep us on our toes. His cast - all uniformly good - inhabit his world with grace. Mr DiCaprio does most of the film's emotional heavy-lifting and comes off well; he is immeasurably aided by Ms Cotillard, who glamorously personifies the human id, and Mr Gordon-Levitt supplies the film with an excess of cool by expertly underplaying. Hans Zimmer's score is a touch bombastic at points, but otherwise, this is a visual - and psychological - treat in every way. ett reflections, reel to real, psychotherapy, counselling, blogEdwin Tan September 29, 2018 reel to real, R2R, film, movies, cinema, review, les chansons d'amour, christophe honore, alex beaupain, louis garrel, gregorio leprince-ringuet, chiara mastroianni, ludivine saigner, clotilde hesme, musical, ..